A classroom simulator platform operating out of UCF is breaking new ground for how teachers hone their craft. Stepping in front of a classroom of skeptical students can be nerve-wracking for first-time teachers, but a new teaching platform at the University of Central Florida gives educators-in-training the option of conquering their classroom jitters in a virtual environment. Educators must navigate social, pedagogical and professional hurdles all at once. And TeachLive is the first of its kind — a classroom simulator that can emulate these challenges and scale its difficulty to the specific needs of the teacher. TeachLive places a teacher-in-training in a virtual classroom populated by computer-generated students. A Skype conference call and a Microsoft Kinect motion sensor power the high-tech pantomiming behind the platform. It's currently being used at more than 80 campuses across the U.S. to train some of the next generation of educators, and it appears to be working. Dieker, formerly of Lockheed Martin, is familiar with the use of simulators to familiarize people with weapons systems for combat environments. But the classroom comes with its own unique set of challenges, not the least of which is that it is untested territory for simulators, she says. They've invested hours of research to ensure TeachLive can meet its goals. Watch a video of TeachLive in action. EdTech had the opportunity to test-drive TeachLive and experience one of these classrooms. Taylor Bousfield, director of research and development for TeachLive, which operates out of the University of Central Florida, in Orlando, helped orchestrate EdTech’s session. She kicked off the class with the assurance that no matter what happened, there wouldn’t be any casualties. "No students are harmed in the making of our teachers,” says Bousfield with a laugh. None of it is real. TeachLive personnel are watching the video, giving the student avatars a voice and controlling their behaviors. The graphics resemble those found in video games. But despite these technological barriers, the pressure of leading a class feels real because of the interactive nature of the experience. 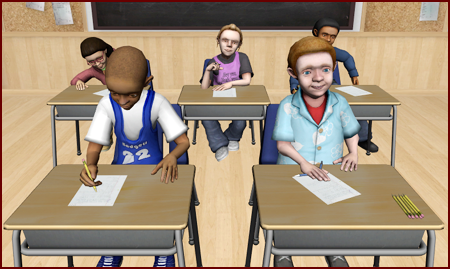 Each student avatar is given a unique personality, dictated not only by the actor voicing the role but also through the range of pre-programmed behavior routines. In one of the elementary school settings, CJ will interrupt class with her opinions on the lesson or the teacher, or on school in general. Sean, the class chatterbox, will happily seize the reins of conversation if given the opportunity. And Maria, a particularly anxious student, may hit her limit and curl up on the floor of the classroom. A successful teacher must circumvent all of these challenges while keeping the class on task and maintaining a professional rapport with the students, and TeachLive can change the difficulty of these encounters on the fly. Each session can be programmed to exacerbate the classroom events and character quirks from any of the students, so educators can practice responding to a targeted behavior or even to student disabilities. Dieker says she's witnessed teachers train with TeachLive and successfully translate their experiences into real classrooms with real students. The immediate feedback from the students and the immersive nature of the teaching sessions make the experiences very focused, says Dieker, resulting in 10 minutes that equates to about one hour of class time. Between sessions, engineers are hard at work programming a new simulation shaped to the performance of the teacher. Dieker and her colleagues capture every movement and response by the teacher and use that data to challenge the teacher. “We know all the things that make a great teacher. By using analytics, we know what makes you nervous and how well you interact with certain students. Using these tools, we can gauge your strengths and weaknesses as a teacher,” says Dieker. The team at TeachLive is now exploring the potential for other ways in which the technology can be used to help people, including career training.